Three years ago a heart broken Merryn Sota got in a SUV and drove away from California. Call it fate or serendipity, but when the vehicle broke down outside of Braden, Iowa she fell in love with the calm and community. 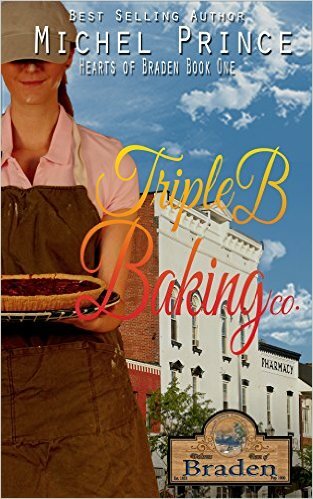 Using her skill as a baker she opened up Braden Buttery Bites Bakery which the town lovingly renamed the Triple B. Every confection she makes heals her wounded heart a little bit. Ever since the tragedy, the only way Austin Larsen can cope with life is to have it completely regimented. The Triple B brought schedule to his life. Something to focus on day by day. When a snowstorm hits the small town Austin’s schedule is disrupted and old wounds are reopened. Only the hospitality of the Triple B, along with Merryn, can right his world. However, as Merryn and Austin grow closer, their pasts resurface and threaten to destroy their happiness forever. Note from Tricia: I had the pleasure of reading this book and I'm so glad I did! I loved the dynamics between the characters in this book. Not just Merryn and Austin, but the relationships between the secondary characters as well. There's a real sense of community in this book that adds that "something special" factor. If you're looking for a spicy romance with unforgettable characters, this is the book for you.